The EXP® Guard Column cartridge system is rated to 15,000 psi with hand-tight replaceable cartridges. This unique design connects directly to any UHPLC column with the auto-adjusting Titanium Hybrid Ferrule and EXP® Fittings, providing repeated zero-dead-volume connections and easy adjustability between various column types. Free-Turn¨ architecture allows the user to change cartridges by hand without breaking fluid connections on the holder inlet/ outlet. The combination of low-dispersion and ultra high-pressure capabilities provides effective protection with negligible effects on retention time, plate count, and peak shape. For use with EXP® Direct Connect Holder 15-02-03965. Hand-tight guard replacement = NO TOOLS! 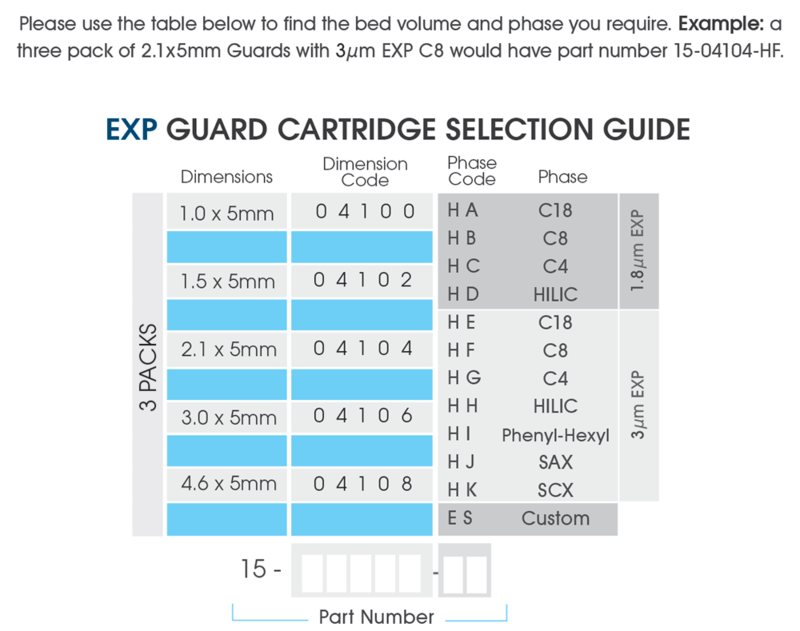 Click the button below to add the EXP® Guard Column Cartridges to your wish list.